Do you like Finding Pirate Treasure? Share it with your friends. Finding Pirate Treasure is an excellent logic flash game where you have a total of thirty different levels of difficulty. 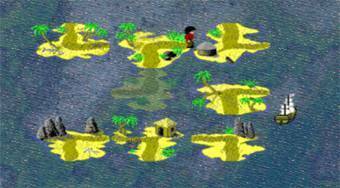 In each round, your task will be to move small pieces of the island so that a boy in a red trick avoiding a collision with the pirates, picking up their treasures and eventually getting to the ship.